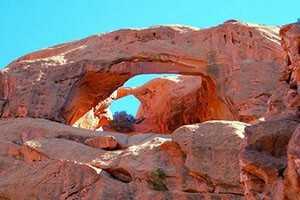 Take a guided ATV or jeep tour in the gorgeous red rock land of canyons, arches and mazes near Moab, Utah. This is one of the best way to experience this area's rugged beauty. The Moab region has literally hundreds of trails available to ride, and a tour with an experienced off-roader will offer excitement and safety. Take an adventure into a land of 50 million-year-old sandstone arches and short interpretive hikes with our knowledgeable guides against a backdrop of Anasazi ruins. Official concessionaires of Canyonlands and Arches National Parks invites you to share our experience and knowledge of the backcountry on a guided 4X4 tour. 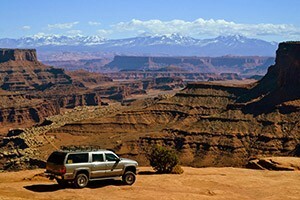 Utah Jeep Tours through the Canyonlands. Explore Canyonlands scenery & exploring, hiking, rock art, photography, geology, archaeology, & paleontology. 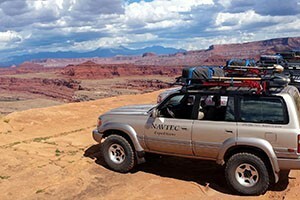 With locations in Moab and Sedona, Barlow Adventures offers jeep rentals and tours. Local jeep experts will do all the work as you sit back and take in the sights! Hold on for this fun filled and extreme adventure. Take a guided tour or go your own way with Hummers, UTV/ATVs, Canyoneering or dirt bike rentals found right in the center of Moab. 27 package options for rafting and jeep tours in Colorado, Utah and Arizona. Trips offered by length, intensity, location or river. Group and individual tours available around Moab. Thrillseeking and Sightseeing tours alike. Ride your own rig or one of our custom 4x4 vehicles. Custom & private off-road motorcycle tours around the Moab desert & LaSal & Abajao Mountains. The most miles on the best trails. Bring your own bike or ride ours. ATV and Rzr rentals and tours for exploring Moab on your own terms. Tours and rentals for side x side adventures in the Moab area ... a great way to see the red rock! Making adventures happen on wheels in Moab! Hummers, ATVs, motorcycles, Jeeps and mountain biking tours all with a money back guarantee. Ride in a guided Jeep Tour - Rent a Jeep or RZR/ATV and drive yourself with or without a guide. Membership based Jeep club focused on trail ratings and events, $40/year, mainly for the frequent Moab trail users. Let a local expert take you along the infamous Hell's Revenge Jeep Trail! Providing UTV rentals and guided UTV tours with the newest machines, the Polaris RZR and Yamaha Viking, in the Moab area. Western water experts offering multi-day trips for rafting adventures throughout the SW. Plan now and book early! Water adventures on Green, Salmon and Colorado Rivers, half, full and multi-day trips including rafts, life jackets, shuttle pick up. Arizona Native, David Hellman, wants to take you on the ride of your life.